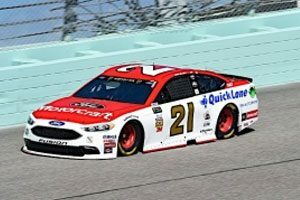 For their final race together, Ryan Blaney and the Wood Brothers team will start the Ford EcoBoost 400 at Homestead-Miami Speedway from a familiar position. 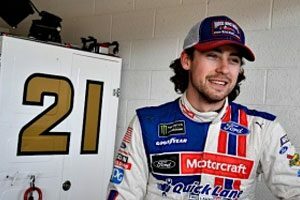 Blaney, crew chief Jeremy Bullins, and the Motorcraft/Quick Lane team bounced back from a mediocre practice session to advance through all three rounds of knock-out qualifying and earn the 11th starting spot for Sunday’s finale of Ford Championship Weekend. It was the 26th time in 36 races this season that Blaney and the No. 21 team have qualified among the top 12. Blaney and the Motorcraft/Quick Lane team were 20th fastest in Friday’s opening practice, with a best lap at 168.972 miles per hour. After some tuning on the No. 21 Fusion, Blaney was 14th fastest in the opening round of qualifying with a speed of 172.590 mph. He ran a lap at 173.055 mph in Round Two, which was ninth fastest of the 24 drivers and earned him a spot among the elite 12 qualifiers. His final lap, a 171.255 mph, earned him the 11th starting spot for Sunday’s season-ending Ford EcoBoost 400. Blaney also said the increase in his speed in qualifying compared to his speed in practice was due in part to the fact that practice was held during the day and qualifying at night. “We made some adjustments to the car between practice and qualifying, but the biggest difference is the temperature,” he said. Sunday’s Ford EcoBoost 400 is set to get the green flag just after 2:30 p.m. with TV coverage on NBC.